Whilst equities closed moderately mixed, the VIX was unable to hold the morning gains (intra high 16.00), and settled -4.8% @ 14.33. Near term outlook still offers an equity retrace to the sp'2060/20 zone, which should equate to VIX briefly testing the key 20 threshold. *net weekly decline of -4.9%. 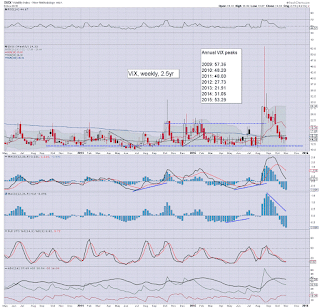 Broadly, the VIX remains very subdued, as the US capital market is increasingly confident into year end. A brief foray into the VIX 20s looks probable at least once or twice by mid December, but with most equity indexes set to break new historic highs, VIX will likely remain low. 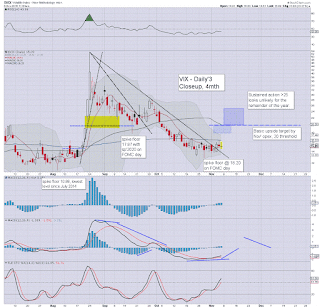 *I have ZERO interest in being long VIX until late spring 2016. US equity indexes closed moderately mixed, sp -0.7pts @ 2099 (intra low 2083). The two leaders - Trans/R2K, both settled higher by 0.7%. Near term outlook remains for a retrace, at least to the 2060s, if not the 2020s, before resuming broadly upward into year end. *closing hour action: minor chop.. leaning on the upside. ... and another week in the twisted casino comes to a close. I didn't note it, but I was kinda expecting net job gains of 200/225k. Frankly, I'm still not sure what to make of the 271k number. It could certainly be revised significantly lower, but then other aspects of today's report were reasonable, esp' earnings. Anyway, so long as the Dec'4th jobs number comes in anywhere >200k, we'll get a rate hike at the Dec' FOMC. Ironically, at the current rate, it will become a sell the news event (if briefly) for the financials. 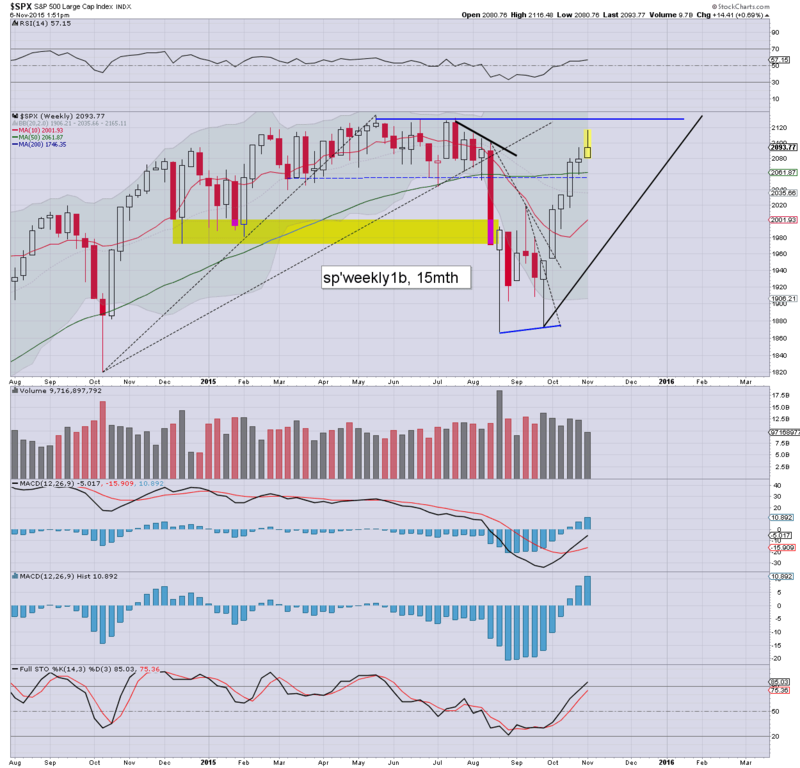 US equities look vulnerable into the weekly close, although as things are, a sixth consecutive net weekly gain for the sp'500 looks probable. Regardless of the exact close, with a rate rise now likely at the Dec' FOMC, things are really starting to get interesting in terms of the outlook for 2016. Price structure on the hourly chart could be argued is just a giant bull flag - that begins from the sp'2116 high, but considering the daily MACD cycles, it still appears we're already in a retrace.. that will either floor in the 2060s.. or the 2020s. 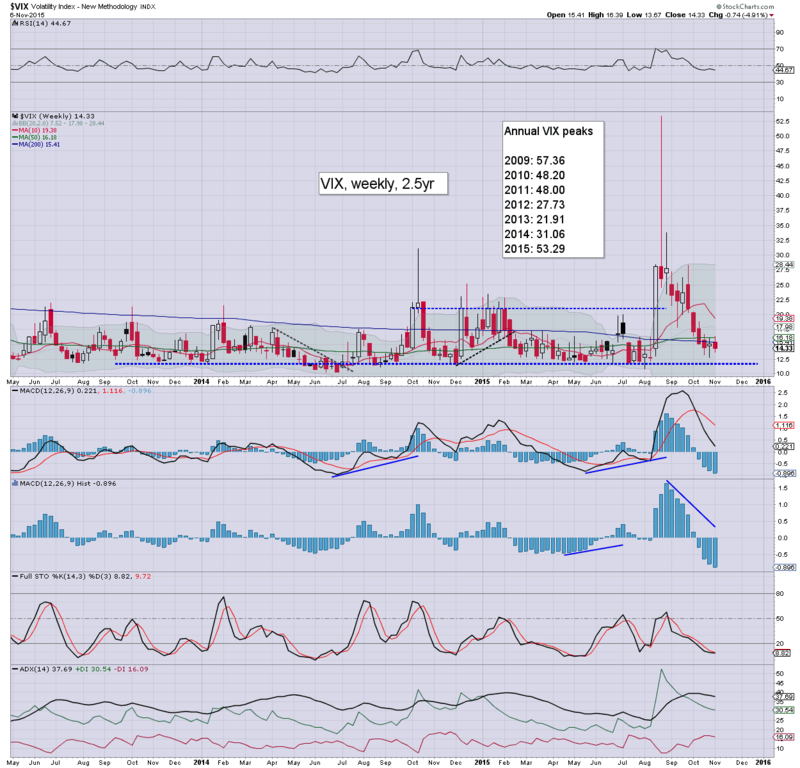 Considering the VIX is only in the 15s.... the key 20 threshold would probably equate to at least the 2050/40s. 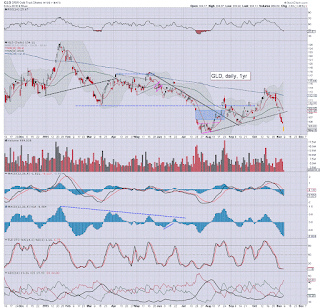 notable weakness: miners, GDX, -3.8%... a horrible weak for anything gold related. Oil remains similarly weak, -2.1% in the $44s. back at the close...... unless we break <2079.. 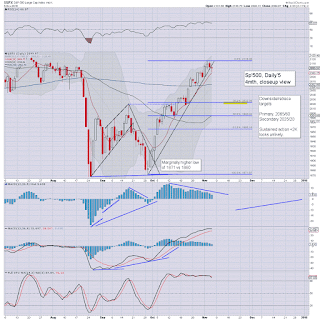 US equities remain moderately weak, with the sp -6pts @ 2093. There remains threat of another wave lower into the weekly close. Equity bears should be seeking a break <2079. USD is holding powerful gains of 1.3% in the DXY 99.30s... and that is not helping the precious metals/Oil. 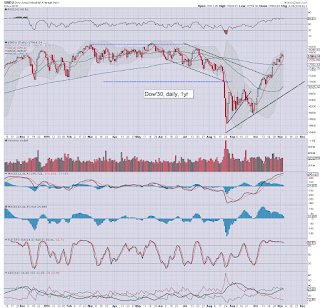 As things are, we're set for the sixth consecutive net weekly gain.. although any close in the 2085/80 zone would at least offer a spiky top candle this week, which would be suggestive of downside across the next two weeks. Q. Anyone wondering if today's jobs data will be revised significantly lower, or is this actual good news? Metals remain very weak, Gold -$13, with Silver -1.5%. 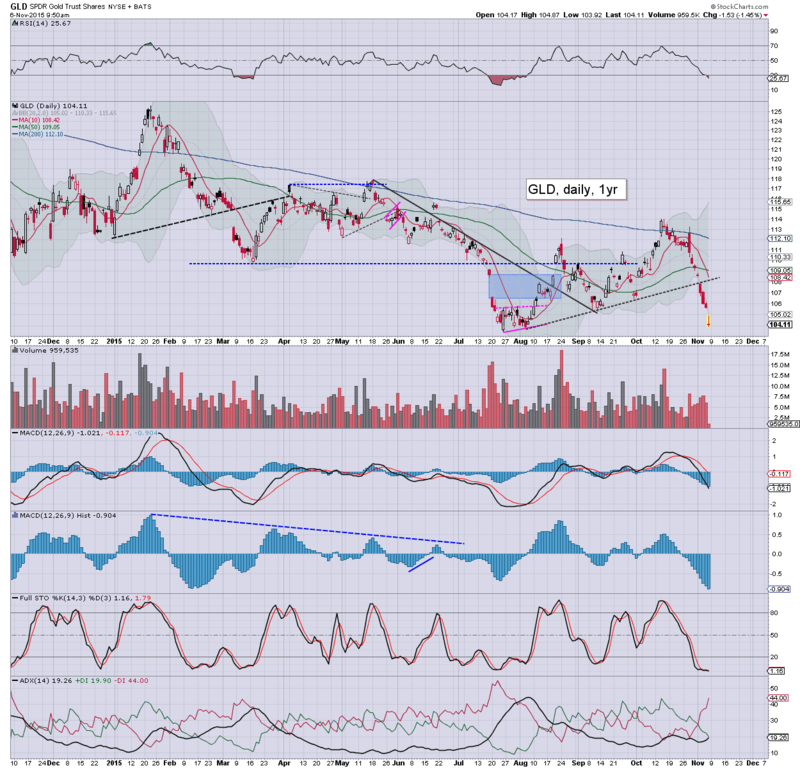 Related miners, GDX -3.3%... horrible week. 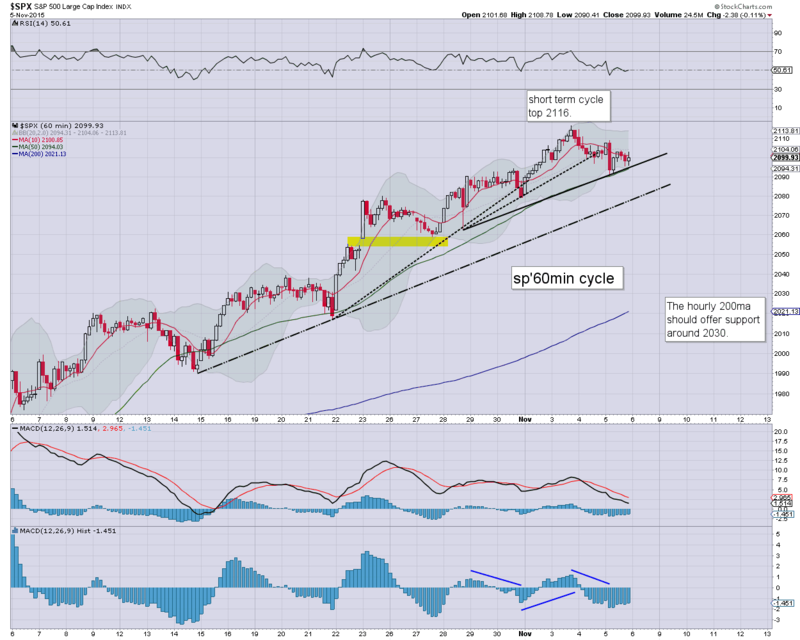 Despite a number of attempts to rally, equities remain moderately lower, sp -10pts @ 2089. USD is holding powerful gains, +1.4% in the DXY 99.20s. A monthly close (whether Nov, Dec.. or Jan).. above the DXY 100 threshold looks a given... and has a great many implications for 2016. It remains a bit messy, but broadly.. the underlying weakness is there.. a weekly close in the 2070s would be useful to the bears.. and offer clarity that we'll get that retrace to the 2020s.. where the 50dma will be lurking by Nov' opex. notable strength: BABA -4.6%, as Jim Chanos is reported on CNBC that BABA is a target short. 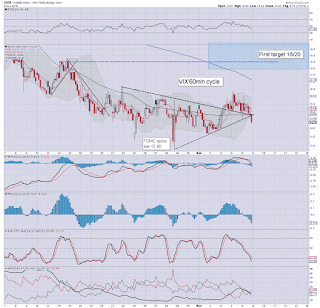 A net weekly decline of around -3%... conclusive break of rising support. 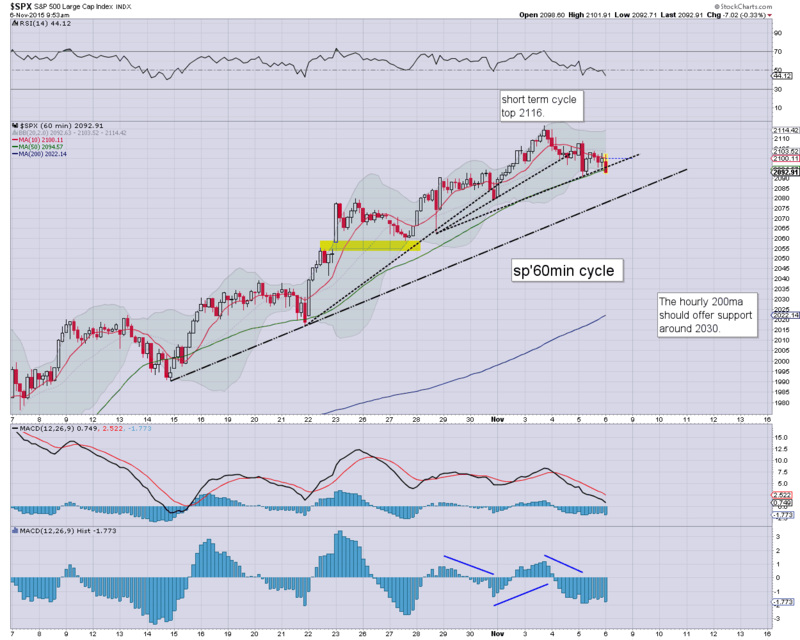 The bigger monthly cycle looks ugly.. first grander target is the 100/95 zone. US equities are seeing renewed weakness, with the morning low of sp'2083 set to be broken this afternoon. Daily MACD cycles continue to swing back toward the bears.. offering a retrace (at min) to the 200dma in the low 2060s.. and almost equally viable.. the 50dma in the 2020s, viable within 4-7 trading days. So.. a hell of a lot of price chop today.. as the market is battling it out. Daily charts remain suggestive of a near term retrace.. and I'm still calling 2116 a short term high. notable weakness... as the USD +1.2% in the DXY 99.20s. US equities remain moderately mixed, with the sp' seeing an early low of 2083.. just 2/3pts above core rising trend. For now.. the hourly cycles are threatening renewed upside to the 2120s.. but... the daily MACD cycles are very close to officially turning bearish. *there are an absolute mountain of key issues to highlight.... not least the USD, metals/oil, and hell, lets not forget the bond market. 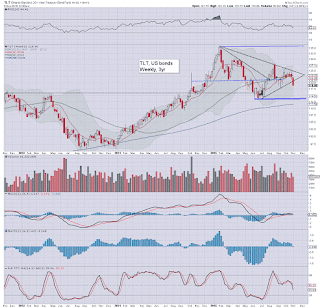 TLT -1.5% in the $118s, but I'll have to cover that later... no time right now. The grander issue is that the mainstream is now adjusting to the notion of higher rates. Ohh, and I realise some out there will still say it won't happen.. and that besides... we're still going to collapse to sp'1500.. or lower next year. Right? I can only suggest people consider BAC. 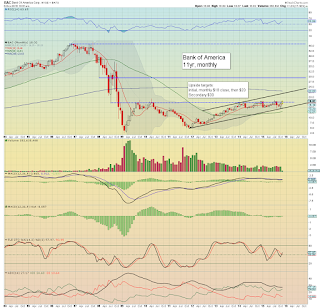 It is arguably a powerful signal - once a monthly close >$18... of where the broader market is headed next year. Whilst equities trade moderately lower, and remain very vulnerable... the real story remains the USD, +1.3% in the DXY 99.20s. 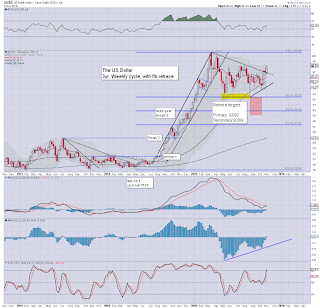 The implications for the giant intl' corps, precious metals.. and Oil.. should be absolutely clear. Not surprisingly, financials are soaring.. on the realisation that rates are set to start rising. A pretty incredible early morning.. as the USD explodes into the DXY 99s, and threatening a monthly close in the DXY 100s. The mid/long term implications of another huge wave higher should be clear. So.. equities are VERY mixed, and financials explode higher, but energy/miners, and heavy industrials suffer. Gold loses the key $1100 threshold. 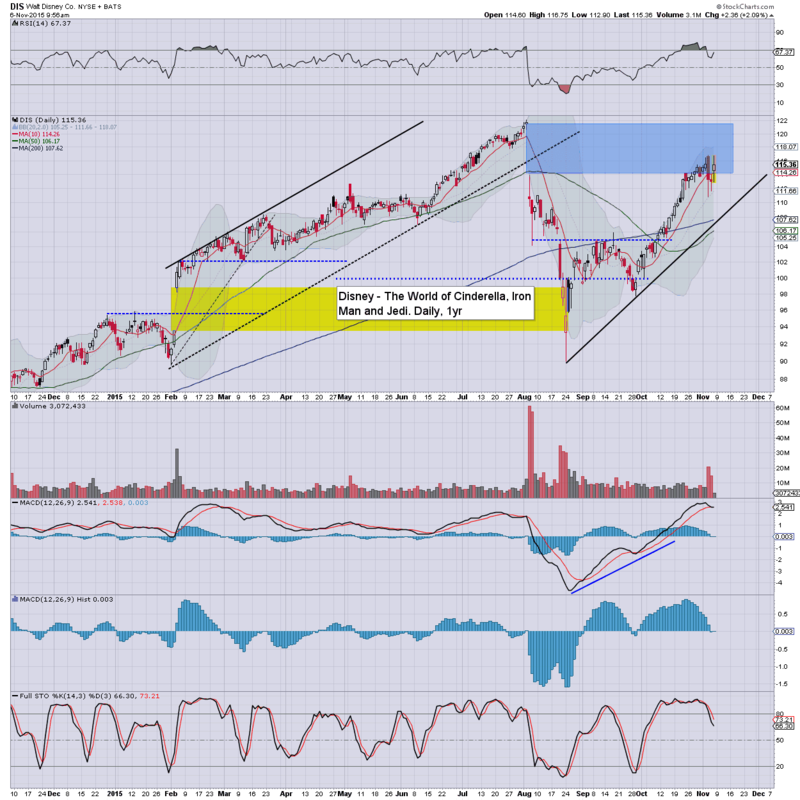 $1000 looks due before year end. 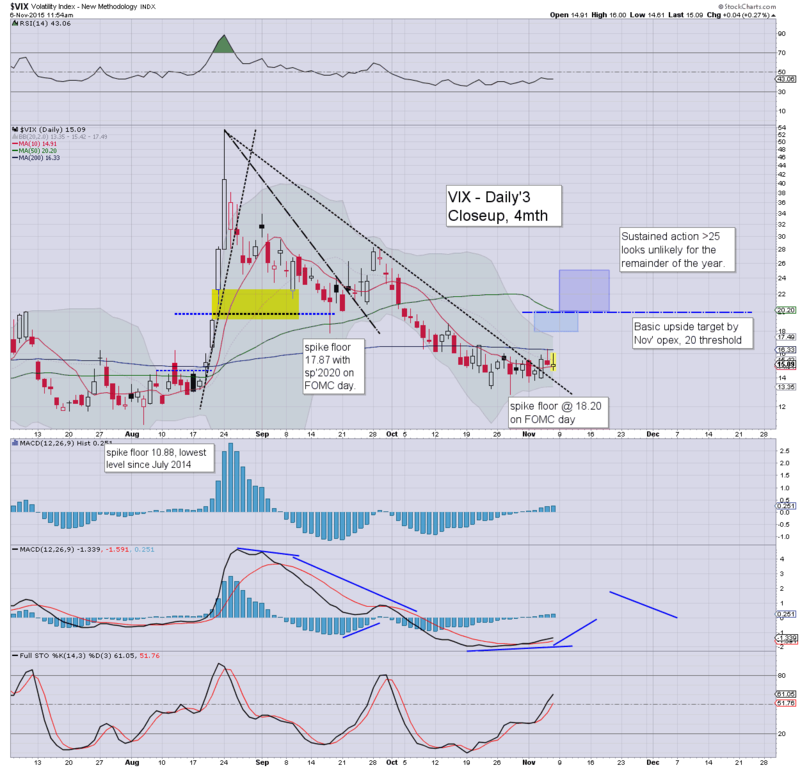 Again.. implications for the related mining stocks are clear. Earnings were fine... stock is headed far far higher.... next year. 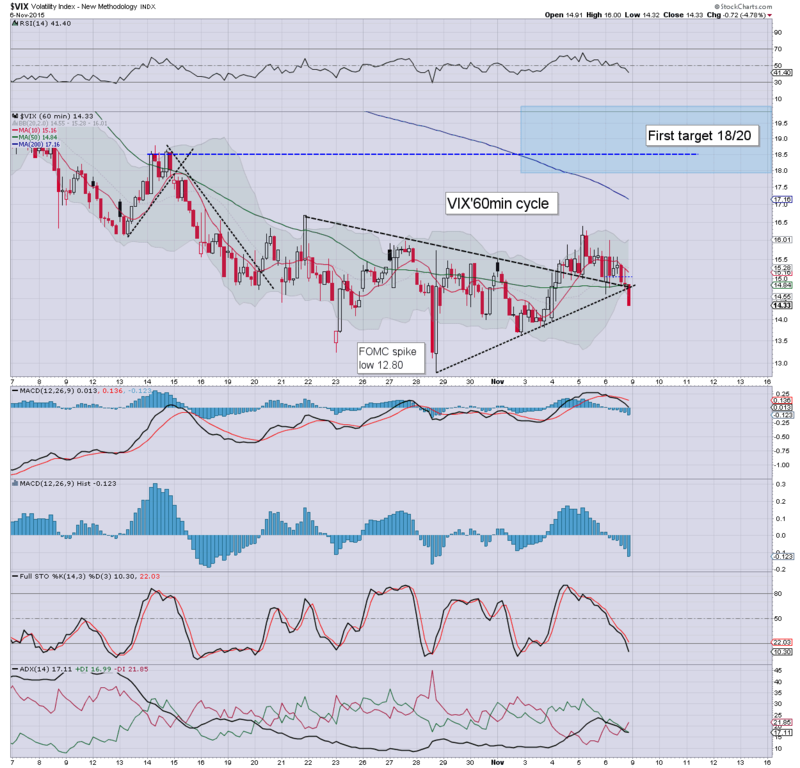 Near term.. still vulnerable.. with the main market... not least due to currency issues. BAC... testing the $18 threshold. 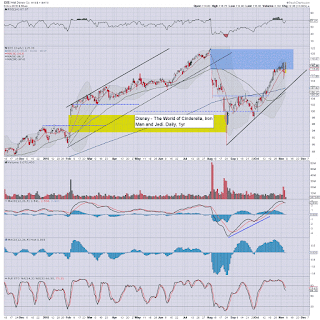 Target by late spring/early summer 2016..... $22/23..... do the math.. and extrapolate to the sp'500. 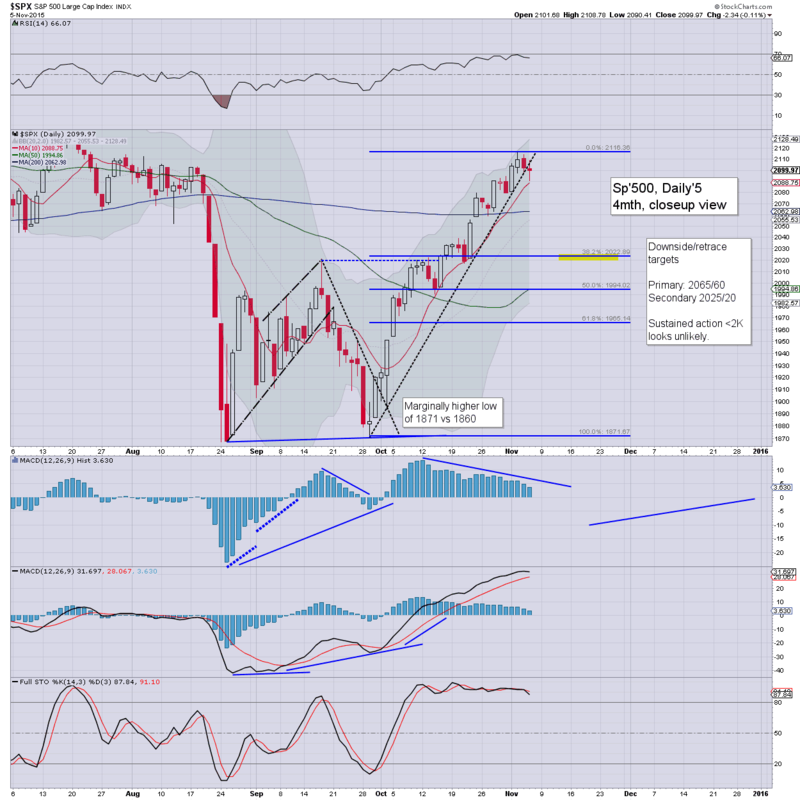 so.. we've sp'2083... a little bounce.... but remaining vulnerable as the daily cycles continue to swing back toward the equity bears. Clearly, currency changes are going to spook some... would impact the Dow most (in theory). Good morning. US equity futures are fractionally lower (ahead of the jobs data), sp -1pt, we're set to open at 2098. USD is +0.2% in the DXY 98.10s. Gold +$5. Oil u/c. Little to add.. ahead of the jobs data. Equity bears must see a weekly close <2100...any net daily gain today...and a retrace could be delayed until new historic highs. 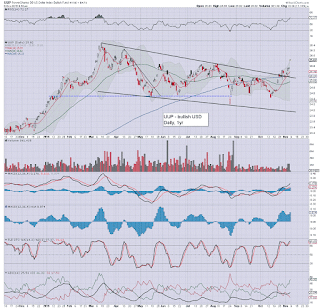 China: +1.9% @ 3590.. a rather bullish end to a bullish week. 8.31am.. Net job gains: 271k, headline rate: 5.0%. USD is SCREAMING upward.. +1.2% in the DXY 99s. ohoh... this is serious stuff! 8.35am.. Equities are pretty unstable... sp' swings from -7pts to +4pts. 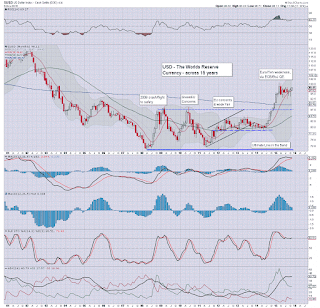 Underlying issue remains.... USD is strong... now a mere 1% from ultimate breakout. 8.39am.. Gold -$12.. Silver -1.1%... miners.. GDX -2.7%..
Key thresholds breaking.... Gold bugs look toast into year end.... as expected. 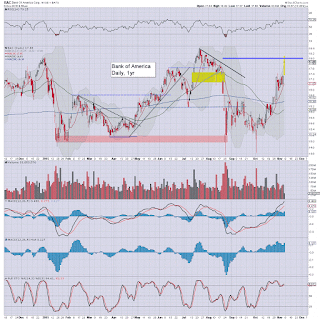 notable strength: financials... BAC +2.6%.. on higher rate hopes. 8.43am.. sp -7pts... 2092.... with rising support @ 2080. Clearly, its not going to be a sig' gap lower... and bears are going to find it tough to break into the 2070s.. Anyway... again, the real issue here is the USD... and the related implications for commodities, notably Oil and Gold.... and their related drillers/miner stocks. 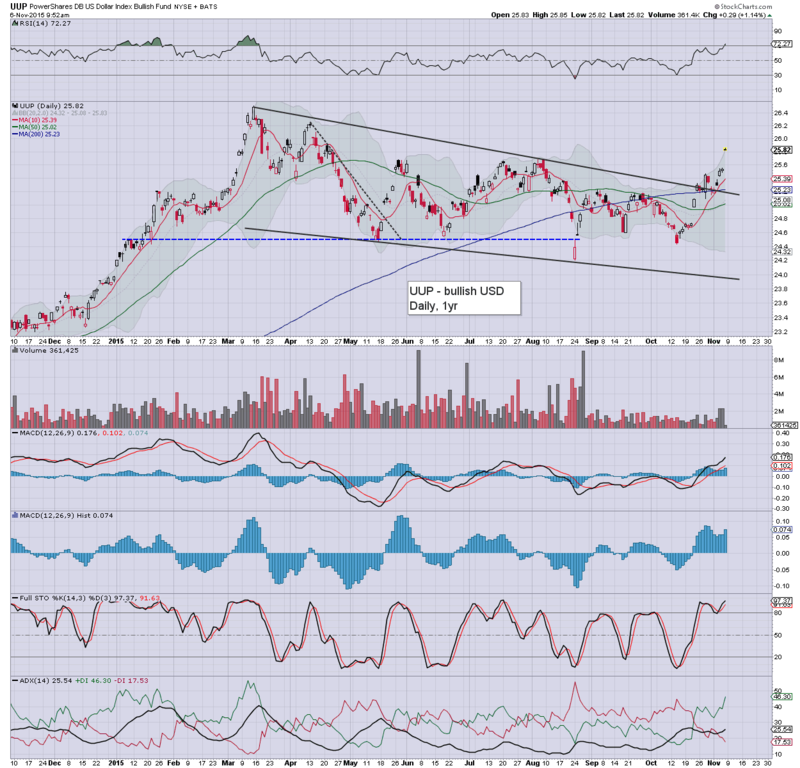 Metals imploding.... Gold -$14.. $1090/89 or so. 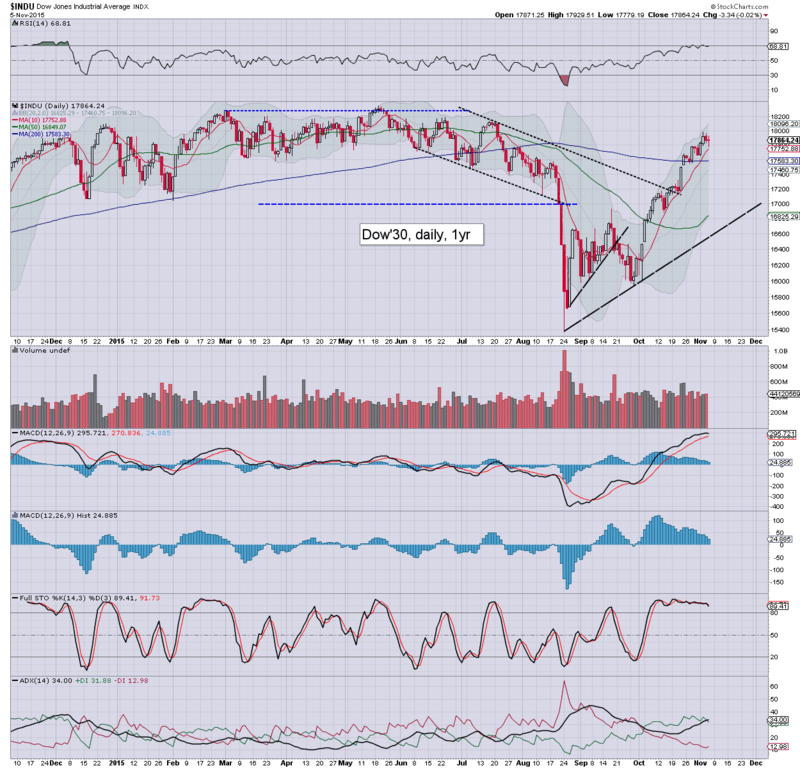 New multi-year lows <1072 are coming, but then.... you knew that... right? 8.57am... things slowly unravelling. sp -10pts... 2089. 9.00am... Oil following the metals... -1.6%... pressured by KING dollar. 9.15am... USD +1.4% in the DXY 99.30s... incredible.. but not surprising. Gold -$17... new lows <1072 imminent. What are the gold bugs going to blame for this? 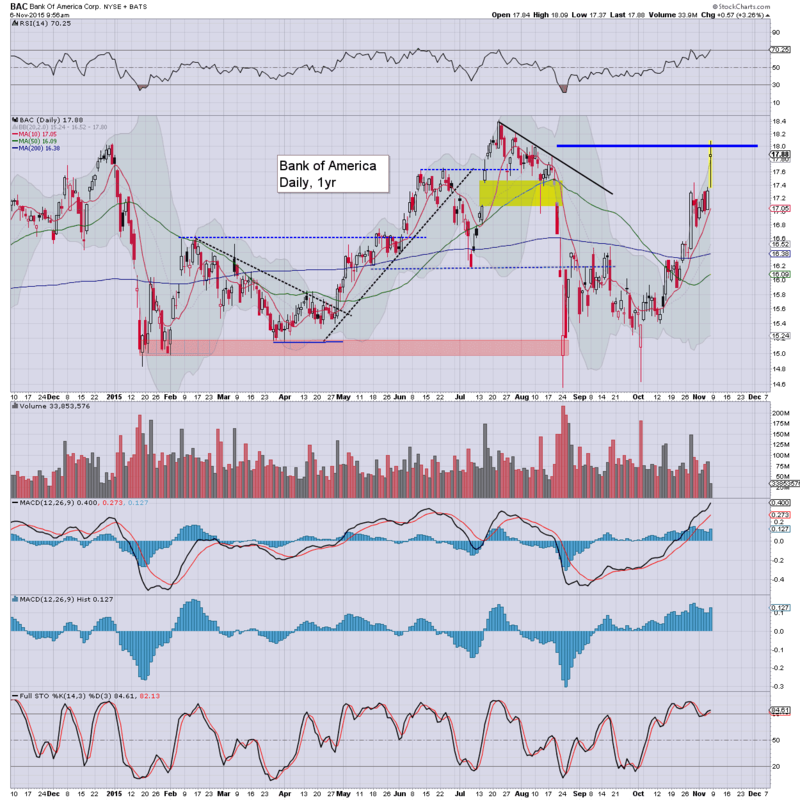 JPM, the Fed... or would they even turn on the Schiff? 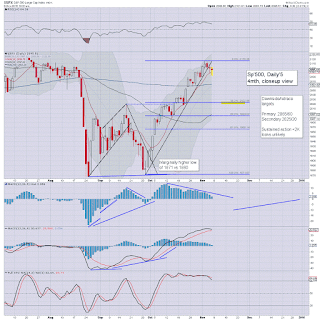 Equities remain choppy.... sp -5pts... 2094.... the gains in the financials are helping keep things together. 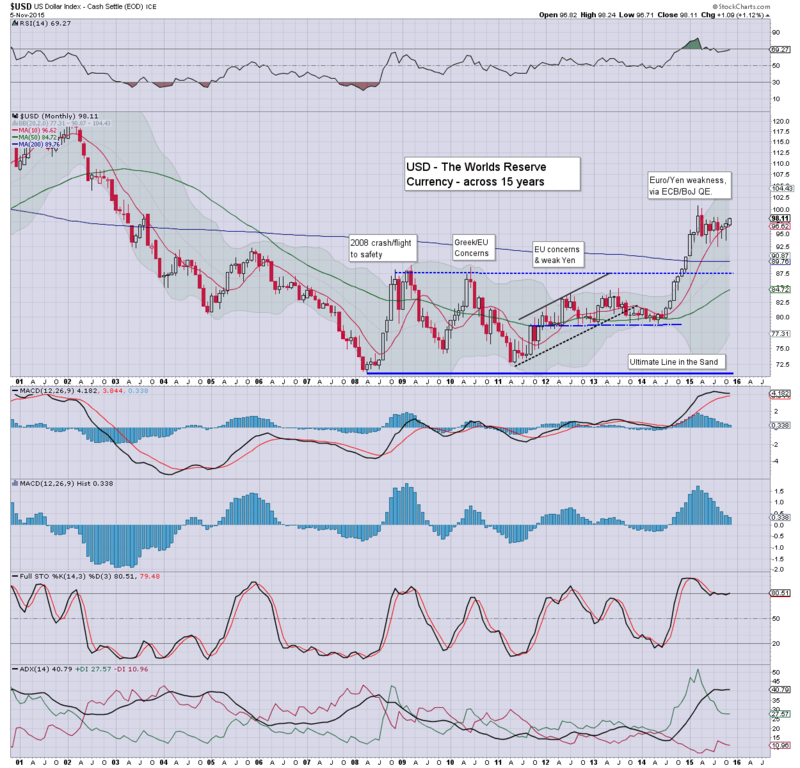 USD remains king of FIAT land, and so far this month, is net higher by 1.1% @ DXY 98.11. Next key upside target is the giant psy' level of 100. 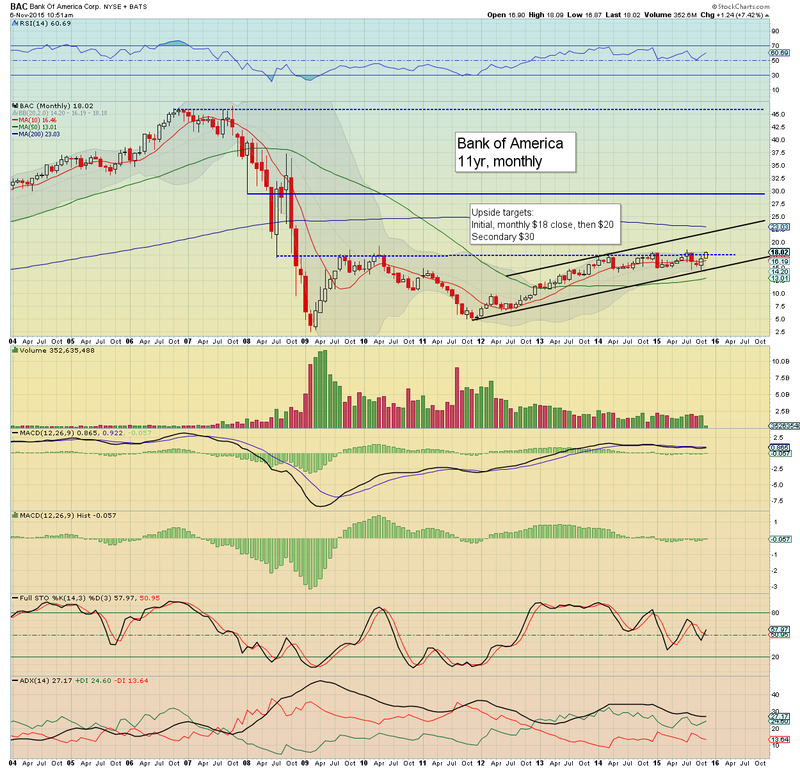 Any monthly close >100, will open the door to another massive appreciation.. at least to the 120s. 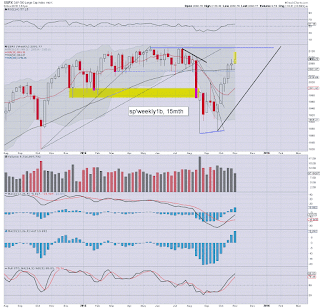 Suffice to note... the weekly MACD (blue bar histogram) cycle is turning positive. 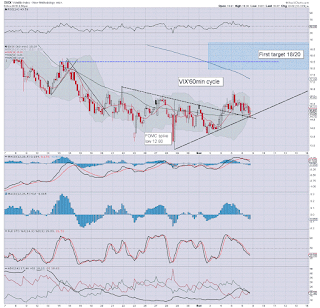 The giant monthly cycle is offering price structure of a massive bull flag that been growing since the high of DXY 100.71 in March. 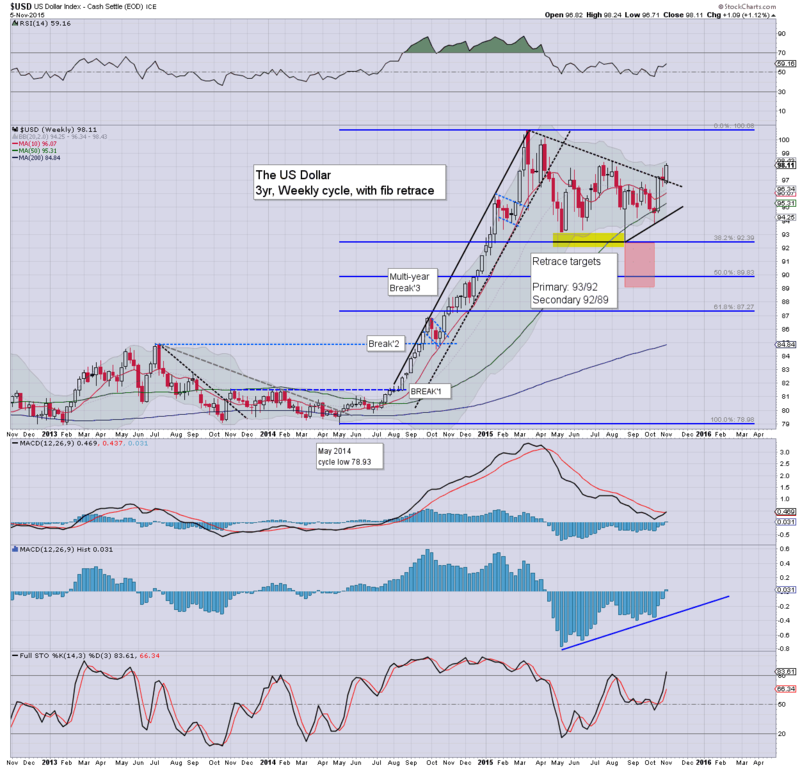 Implications of a higher USD should be pretty clear. In particular.. Oil/precious metals will be especially vulnerable to underlying downward pressure. Friday will see consumer credit data (3pm), but far more important to the market.. the latest monthly jobs data. Market is expecting 190k net gains, with a slightly lower headline jobless rate of 5.0%. Any number much above 200K could be considered as 'good news as bad news' in terms of int' rates. *it is highly notable that Fed official Bullard will be speaking in early morning. 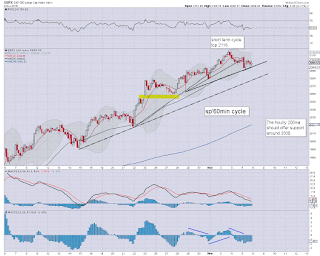 US equities are still holding within the upward trend from the Aug/Sept' lows. 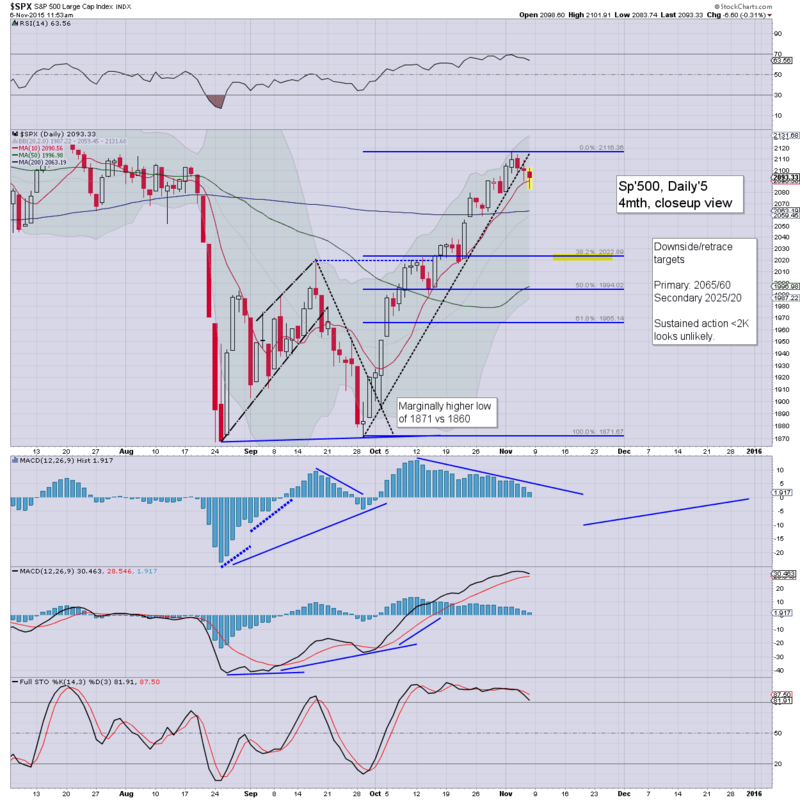 At best, equity bears could manage a 38% fib' retrace to the sp'2020s by Nov' opex... but from there... resuming upward into year end... and beyond.